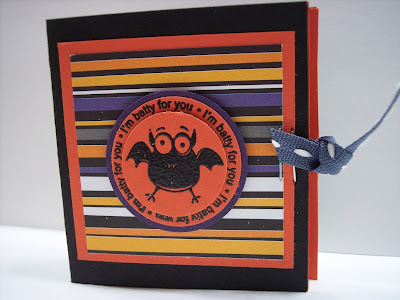 The punches, stamp, ink, card stock, ribbon, and embossing powder are all SU!, but the patterned paper is LYB. I won an amazing Little Yellow Bicycle door prize at our 24-hour Scrap Pink event at The Scrap Affair. It was SOO much fun and the prizes alone were fabulous! You really have to make your way down there if you live in the Houston area and check them out. This weekend we took the kids to the Fort Bend County Fair. I'll have to unload my camera and share some pics - there were several "firsts" this time around. Gypsy came into our house as a very frisky 9 month old ferret in the fall of 1999. I bought her for Mike because he had always wanted a small furry friend - he wanted her to ride on his shoulder, do tricks, and live forever. 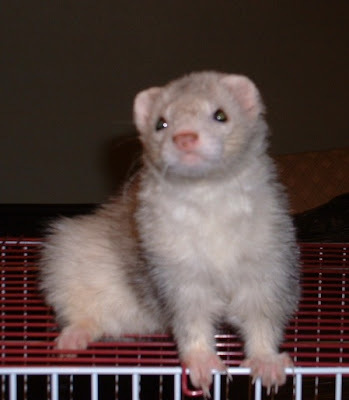 Ferrets are considered an "exotic" pet and they are not exactly easy to care for. They need to bathed often (even when "descented," they still have some powerful oil glands! ), played with daily, cage cleaned daily, and they need a LOT of attention. Ferrets usually live around 6-7 years when properly cared for, though some live for much longer. 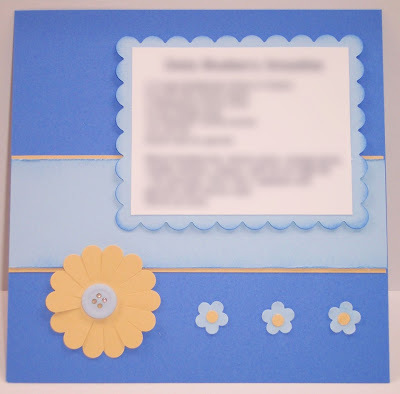 Even with all the clean-up and Ike stress, I still have a craft show that I'm supposed to be preparing for! I thought we wouldn't lose electricity and that I would have a nice birthday weekend to work on getting a lot of projects done, but not so much! Over the past couple of days, though, I've been able to hit the ink again. In addition to representing my SU! business at the craft fair, I'm going to be selling a few little items that have sold well for me in the past at other shows. Here is one of the little trinkets. 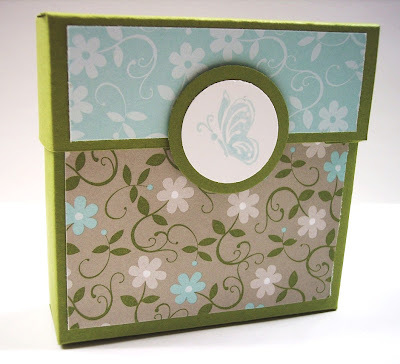 This is a simple 3x3 box that holds 4 mini cards and envelopes. The lid slides off the top. On the eve of my birthday, we sheltered in place per orders and waited for the storm. We had evacuated for Rita, and had returned to a home with only minor wind damage and power intact. So, while I wanted to be prepared for the worst, we not expecting much excitement. We had been told that we were not in a area that would receive much damage - we were a pass through community for people who were dealing with mandatory and voluntary evacuations. We had water, lots of canned goods, flashlights galore. We lost power at 5:30pm on Friday, September 12th and it didn't come back on until Tuesday September 16th.Our plan had been to leave the kids in their rooms until the storm got bad, and then go get them and bring them down to the makeshift bed in our walk-in closet (our only interior room without windows other than the powder room! ), but since the power went out so early, we had to put them in there when they were still wide awake and anxious. We are sheltering in place here in Fort Bend County. Say a prayer for all of us in the way of this storm. Here is my entry for this month's swap - the category is Smoothies or Coffee Drinks. Since I don't drink coffee, my recipe is for a smoothie. We drink smoothies a LOT at my house during the summer. Sometimes for lunch the kids and I will just throw a bunch of fruit and yogurt and ice in the blender and have a drinkable picnic. :) We are into juicing, too, and my kids will even drink vegetable juice! (I'm talking carrot-spinach-tomato juice!) Mmmm...juice! 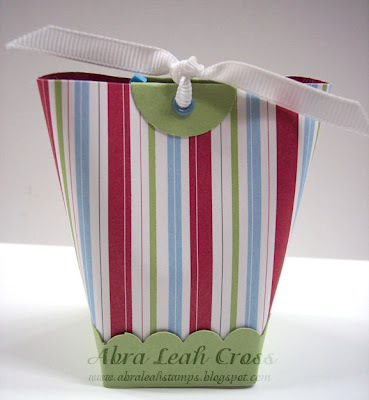 These little bags are all over the Internet courtesy of another blogging stamper, Diana Gibbs. (Click on her name for a link to the original bag and the tutorial.) 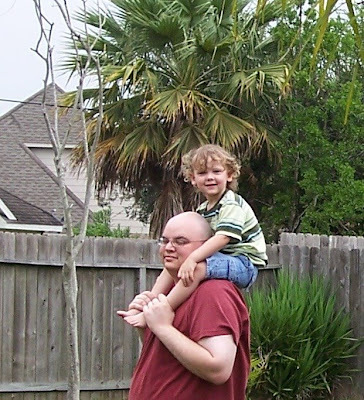 For this one, though, I altered the measurements to make a much smaller version. My finished bag measures just 3" tall with a 1.5" square base. Very sweet and easy to make for little gifts or party favors!